SYNOPSIS - Fitz has survived his first hazardous mission as king’s assassin, but is left little more than a cripple. Battered and bitter, he vows to abandon his oath to King Shrewd, remaining in the distant mountains. But love and events of terrible urgency draw him back to the court at Buckkeep, and into the deadly intrigues of the royal family. No man is so dangerous as the man who cannot decide what he fears. One can only walk so far from one's true self before the bond either snaps, or pulls one back. It’s not the kind of work a man does that says he can be proud or not. It’s how he does it. 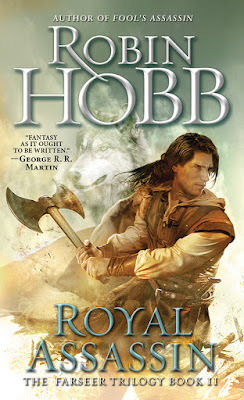 FL Speak - I think Robin Hobb did a far better job in this book, both at plot and character growth. For those of you who have read this book, tell me, did you find it tedious at times or did you nod your head through it? Did you read it as an adult going through just another fantasy or did you live it through the eyes of our 16-17 year old lead character? Authors have this extraordinary ability to weave emotions to words. They live multiple lives, shedding characters as they see fit. As readers, we often do not distinguish between the various characters, their experiences, their ages or their genders. Grave as this error might be, we fail to admit it to ourselves. Fitz finally grows up in this book. Not to an adult yet, but he has grown beyond his years. One part brave, three parts fool. There is also considerable time spent in doubting himself, which can be quite a chore. Robin Hobb made sure that if we are to read about the ecstasy and the adventures, we have to go through the bits that sometimes lulls you to sleep. The ending was quite a nasty shock for me. I'm actually not looking forward to the next book. At least the first 100 pages. This is going to take all my guts.